Brokers are split on the topic of discounting, with many viewing such tactics as necessary to competing for ever-shrinking market share. The fact of the matter, according to CAAMP’s report, is that discounting is most likely here to stay. Harrison estimates his brokerage has to buy-down 50 per cent of its rates to ensure the deal goes through. 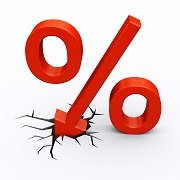 According to CAAMP’s stats, rate discounts average 1.95 percentage points for five-year mortgage terms. The national organization used a wide swath of examples to come to its conclusion.